An old, down-on-his-luck lawyer sets off an endless chain of deceit that backfires on him. A young husband turns a messy accident to his advantage. A foolish man attempts to sell a sack of peas, hampered by the worst memory ever. These three farces demonstrate the difficulty of living harmoniously when our needs conflict with others and the dangers of negotiating with those we don't trust. 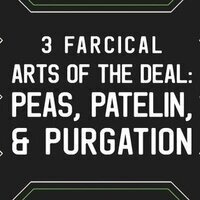 Peas, Patelin, & Purgation will travel to Genoa, Ital,y in July 2019 to perform for the 16th triennial colloquium of the Société Internationale pour l’Étude du Théâtre Médiéval (International Society for the Study of Medieval Theatre).